Snow in early summer is visually invoked by the masses of blooms on Styrax japonicus. Common or Japanese snowbell is the species of Styrax most often grown locally. The UK trade magazine Horticulture Week has an excellent article about species of Styrax, including a section on “What the Specialists Say” regarding growing these small trees and shrubs (Styrax japonicus will typically grow to about 10m (30 ft.)). The cultivar ‘Fargesii’ is considered a more robust selection overall, with larger flowers and leaves. This is recognized on the Royal Horticultural Society’s page for Styrax japonicus ‘Fargesii’; also notable is that it is a recipient of the Award of Garden Merit. To read previous entries on species of Styrax, check out the Styracaceae tag. I almost never think to click on the photos to see them larger, but after looking at this for a few minutes, I did click this one. It’s a stunning photo. That middle flower just glows, with very little fuss around it, except for the leaf echoing the shape of the inflorescence. I like the water on the petals too. I get a lot of volunteers under my species. I’m with Wendy, and I’ll add that the midnight blue background is wonderful – a beautiful photo! 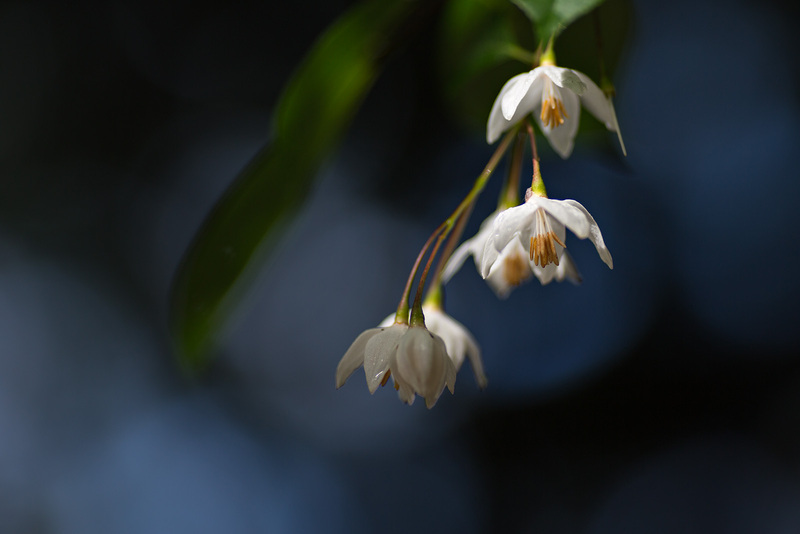 This is timely, because as I drove along a street here (near Seattle) yesterday I noticed trees with pendulous white bells just beginning to flower, and thought, “Carolina silverbells?” Maybe not, maybe it’s the Japanese snowbell, Styrax japonicus. I’ll have to check (and does H. Carolina bloom earlier anyway?). I think the Halesia should have already bloomed in Seattle. A week ago, I saw two H. tetraptera at UBCBG: the species, which was past its prime, and H. tetraptera var. monticola ‘Arnold Pink’, which was just past peak bloom. I went to look for a Carolina silverbells I knew of in a park tonight, but the tree is gone now. You’ll have to check the fruits on your Seattle trees. Thank you very much, Wendy – I will. I don’t know that you’ll read this again, but I may have led you wrong on the Halesia. I didn’t see H. carolina in the UBCBG garden, but I did see H. diptera not quite at peak bloom today. I’d like to withdraw any suggestion about what you might have seen or not seen in Seattle. The trees you see in Seattle are mostly Styrax not Halesia. My Styrax is just in bud stage but I see others in full bloom – location? or maybe different species. Mine are both S. japonica.